Funko's fan-favorite POP! Vinyl Figures are now pocket sized for a new line of keychains! These Pocket POP! Vinyl Keychains feature the characters from this summer's highly-anticipated film, Marvel Studios' Avengers: Age of Ultron, as danglers. 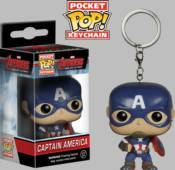 Choose your favorite character and let him defend your keys from Ultron!